Thanks to new data regarding missing Malaysia Air flight MH370, the Malaysian Prime Minister has announced that the plane definitely crashed in the Indian Ocean off the coast of Australia with no survivors. This evening, I was briefed by representatives from the UK Air Accidents Investigation Branch … they informed me that [satellite company] Inmarsat … has been performing further calculations on the data using a type of analysis never before used in an investigation of this sort. They have been able to shed more light on MH370. 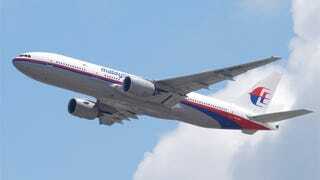 [Investigators] have concluded that MH370 flew along the southern corridor and that its last position was in the middle of the Indian Ocean west of Perth, [Australia]. This is a remote location far from any possible landing sites. It is therefore with deep sadness and regret that I must inform you that according to this new data, Flight MH370 ended in the southern Indian Ocean. Families were reportedly informed of the new information via a text message form Malaysia Airlines, letting them know that the plane went down in the South Indian Ocean "beyond any reasonable doubt." The Navy is sending a black box detector to the area to hopefully put the last pieces of the puzzle together.